Sometimes it seems as though everyone is birthed from the womb with an inherent knowledge of Shakespeare’s Romeo and Juliet. I have a feeling that a similar situation will happen with Suzanne Collins’ novel The Hunger Games in a few generations. Just as the mention of Shakespeare’s famous play immediately conjures up ideas of star-crossed lovers and family feuds, The Hunger Games may inevitably be associated with fights to the death, trust and betrayal, and forbidden love. Today, I’d like to discuss the many similarities between these books that make them more alike than one might initially expect. + Star-crossed lovers. Let’s get this one out of the way first since it’s probably the most obvious similarity. Both of these texts are rooted in romance, particularly relationships that are seemingly not supposed to happen. While Romeo and Juliet shouldn’t be together due to the clash between their families, Katniss and Peeta should be focused on killing each other rather than trying to seduce one another. These relationships occur rapidly yet are fueled by different motivations: love and lust vs. strategy and survival. The flawed natures of both of these relationships emphasize the far extent that people will stretch for romance. + Life and death: The dichotomy of living and dying plays a significant role in both texts. Each of their climactic scenes focuses on the tension between these two opposites and plays with the reader’s expectations of what should happen next. Romance becomes a life source for Katniss and Peeta as it helps them gain the popularity needed to ultimately survive the games; however, love becomes the downfall of Romeo and Juliet as it blinds them to realistic consequences and leads to their hasty deaths. + Youth: Part of the reason these texts are so remarkable is the age of the protagonists: Romeo and Juliet are in their early teen years, whereas Katniss and Peeta are in their later teen years. While this is often one of the more frustrating aspects of Romeo and Juliet for modern readers—they’re willing to commit suicide over someone they’ve known for three days when they’re thirteen? !—age plays a more positive role in Collins’ novel. Katniss and Peeta are able to fight back against an entire oppressive regime even though they are still teenagers. + Rebellion: Likewise, together these texts highlight the advantages and disadvantages of rebelling. While Shakespeare paints a rather bleak picture of what could happen when you go against the wishes of your elders, Collins seems to advocate standing up for what you believe in and opposing unjust authority figures. In this way, romance is used to make a very political statement in The Hunger Games. I hope you’ve enjoyed this look at two very different, very similar texts! 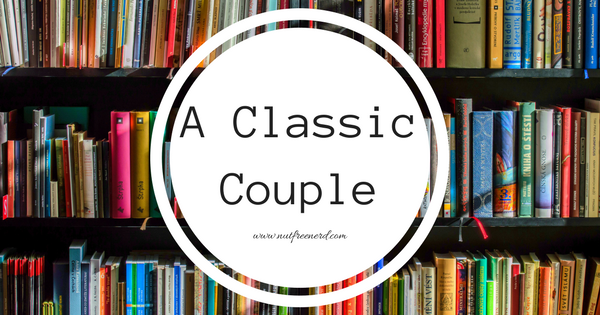 What do you think of this classic couple? What other books would you pair with Romeo and Juliet? What are your thoughts on either or both of these books? Let me know in the comments section below! I adore these posts of yours! 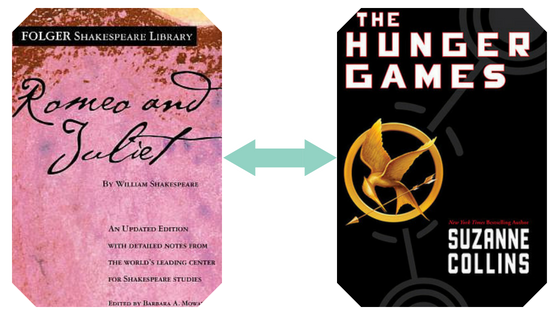 Romeo and Juliet is my least favorite Shakespeare play, but I love The Hunger Games and I definitely think this coupling makes sense! Loved the post! I never thought about it before, but yes, there are a lot of parallels! Oooh those are all really interesting pairs as well! I’ve never read Warm Bodies but I’ve heard great things about it. I loved hunger games and also R&J. Never really considered the parallels, but you made a good point. This is such a creative idea for a blog post! Brilliant. I had never really thought of these 2 stories as a pair before, but you make an interesting point. I also didn’t realise R and J were only 13! God that is weird. Makes the whole thing kind of sound like a Netflix teen show. Thank you!! Haha I love your Netflix comparison–hilarious!